In an event where you lose all normal communication (tv, radio, cell phones, etc), this would allow you to receive broadcasts from Shortwave and World Band transmissions around the world. It's portable, so if you have to Bug Out, you can take it with you. This radio has above average sensitivity on SW-AM-FM bands and an informative LCD display. 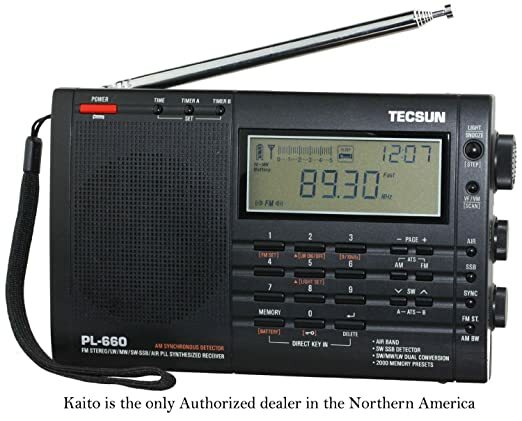 The Tecsun PL-660 Portable AM-FM-LW-Air Shortwave World Band Radio with Single Side Band has lots of additional features for the money including a SYNC detector, narrow filters to tune in on channels more clearly, selectable upper and lower sidebands and bandwidths, a built-in NiMh charger with included batteries means you will not need to purchase batteries for a long time, multiple tuning features and a huge memory storage capacity. For best reception run either the included antennae wire (or a nice retractable antenna such as the Sangean ANT-60 Short Wave Antenna) out of a window as shown in the first video below at the 5:37 mark. "Nothing better for signal sensitivity in this price range....I have tried the Tecsun 600, Tecsun 390, Grundig 350, Grundig 450...I liked this Tecsun 660 better than all of them....I liked the extreme sensitivity on all bands along with the SSB sync. USB/LSB and broad/narrow band filters...None of the above come close in sensitivity..My first night of scanning it picked up 38 SW stations inside a 2 story house from the bottom floor using only the built in antenna on DX at about 10 ft. from the nearest window...It also scanned 17 AM stations and 43 FM stations....Considering the nearest station is 35 miles away I was impressed at the results...."
"Well worth the price. I can't see anything wrong with this radio, its like have a high quality receiver in a small package. I have listened to SSB as if the people were standing in front of me talking. I have stretched out long wires in my yard for 80m,40m,20m and 15m and this radio shines. I previously went through 3 other portable all within 3 weeks and sent them back and gave this one a try. No looking back with upper and lower SSB it's awesome. Don't let the stand stop you, if you want to see what is on the air get this radio. I have listened to Vietnam, Taiwan, Japan, China, Cuba etc. Now when you do get this radio, try it for a few days because if sun spots or storms were involved you may think there is something wrong. Wait for the weather to clear up for a good opinion of this radio." "Simply one of the best portable world band radios I own. I'm a long time world band radio user, and Amateur Radio Operator. I already have too many radios, but decided to buy the TECSUN PL600 on a whim. I have to say I'm more than pleasantly surprised at its performance. The first band I tested was the air band. It picked up all the local air traffic in my area without any issues such interference or bleed over from other bands. Next I tuned in several English SW broadcasts from Europe, etc. Again, the radio performed excellently. The narrow filter allowed me to separate stations when the bands were crowded. The SYNC Detector works good. It's not equal to the SYNC Detector on my Sony 2010, but is on par with my Sony 7600GR. SSB was where I was really amazed. I went to the 75m Amateur Band to see if I could hear anything using the telescopic antenna. After doing a little fine tuning, I picked up a conversation that was so loud and clear, I feared it was bleed over from another band. It wasn't. It was two Amateur Radio Operators having a QSO on the other side of the country. To pick them up as well as I did using a portable radio, and telescopic antenna was amazing. As for FM and AM (MW), all I can say is it picks up both bands well. I didn't do any extensive testing on either, other than attempt some MW DXing. I didn't pick up any distant stations, but it is probably the current conditions in my area, and not the radio's fault. DX has been poor by me lately on all my radios. All in all, I couldn't be any happier with the PL660, especially at this price point. It sounds good, performs great, and has features found on radios costing much more. If I would change one thing on the PL600, it would be to add a RF gain control, and remove the sensitivity switch. If you're looking for a portable world band radio that is loaded with features, and doesn't cost an arm and a leg, I highly recommend the TECSUN PL660." "Bought this as a gift for a Ham. He loves it. Very sensitive and gets SSB sufficiently to make him happy. World bands work well. This is my second purchase of this radio. The first was for me and i love it too. Good travel radio, as it does EVERYTHING but transmit. Nice to have the Air band." "Jewel of a radio. I am an electronic design engineer and amateur radio operator, and for the money, this little guy rocks. It has excellent sensitivity and very good selectivity on all bands. In fact, it is so sensitive that it outperforms my Icom transceiver that cost 20x the price of this jewel with only the rod antenna! I used the included wire antenna for the first week, until I discovered that the telescoping rod pulled in everything I could get with the wire. The sync works well at night, but I rarely use it because it is annoying to tune with it engaged, and really none of the DSP functions do much to add to the already awesome receiver performance." The following YouTube video is a review of the Tecsun PL-660 Portable Shortwave Radio. Go to the 2:10 mark for the actual review. The following YouTube video is another review of the Tecsun PL-660 Portable Shortwave Radio.